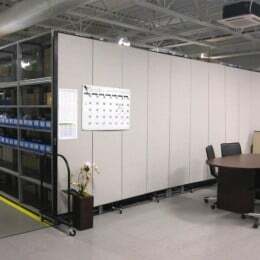 Sortimat contacted Screenflex interested in our Standard Portable Room Dividers to hide equipment and to divide space in their Rolling Meadows, IL, facility. 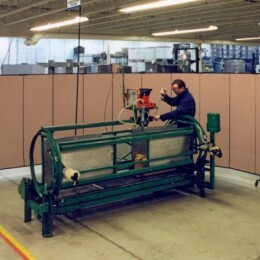 The Rolling Meadows facility is located about 30 minutes from our Screenflex office in Lake Zurich, IL. After listening to the customer’s needs and reviewing the superior features of our Standard Portable Room Divider we decided to bring a partition to their site, for a demonstration. Don Austin and Mike McClure, Screenflex sales managers, brought one of our Standard 6’8″tall x 24’1″ long (13) panel room dividers to show how quickly and easily the partition is set up, ready to go. After seeing first-hand the durability and stability of Screenflex temporary walls, Sortimat knew these dividers were the perfect solution to their needs. Now work equipment is shielded for safety and a functional meeting room is available in the factory.